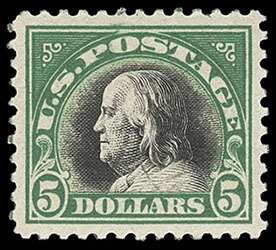 1918, $5 deep green & black, o.g., never hinged, choice centering amid well balanced margins, bright and fresh, Extremely Fine. 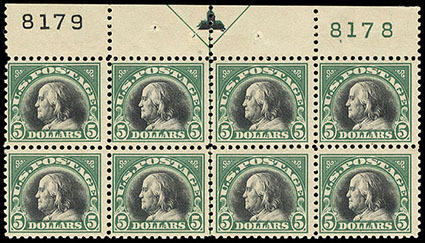 1918, $5 deep green & black, top margin plate block of 8 with plate numbers 8179/8178 & arrow, o.g., never hinged, selvage very slightly reduced, deep rich color, F.-V.F., This issue was printed from single frame (8178) and vignette (8179) plates. 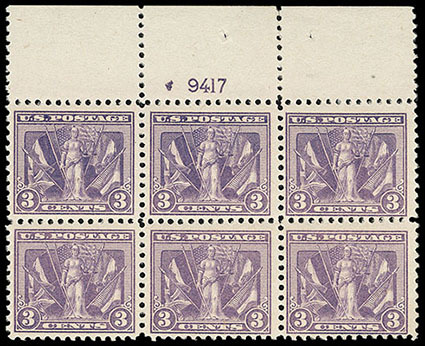 A SCARCE MINT NEVER-HINGED PLATE BLOCK OF EIGHT OF THE 1918 $5.00 ISSUE. 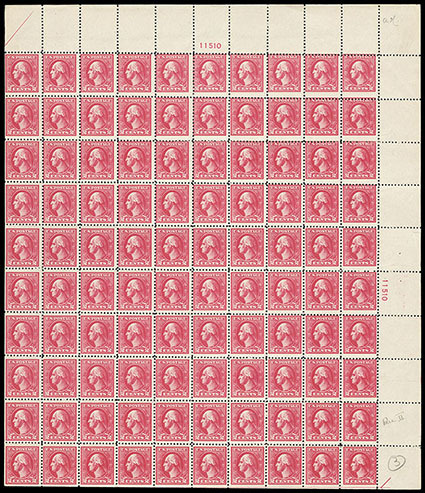 1918, 2¢ carmine, Offset, type Va, double impression, complete sheet of 100, o.g., stamps never hinged, hinged in selvage only, showing strong second impression in stamps and plate numbers, fresh and Fine, an extremely rare intact sheet. Scott No. 528c $15,000 for singles. 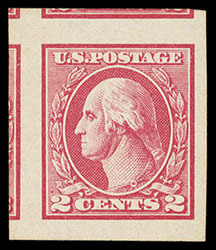 1918, 2¢ carmine, Offset imperf, type V, o.g., never hinged, large to huge margins encompassing portions of adjacent stamp, brilliant color, Superb; with 1980 P.F. 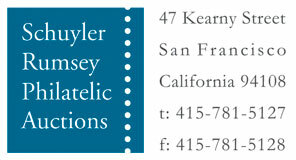 and 2004 P.S.E. certificates, the latter Graded (Superb 98, SMQ $475). 1919, 3¢ Victory, top margin plate number "9417" single, o.g., never hinged, bold color, large well balanced margins, Extremely Fine and choice, a gem plate single; with 2004 & 2015 P.F. certificates, the latter Graded (XF 90). 1919, 3¢ Victory, top margin plate "9417" block of 6, o.g., never hinged, rich color, Very Fine. 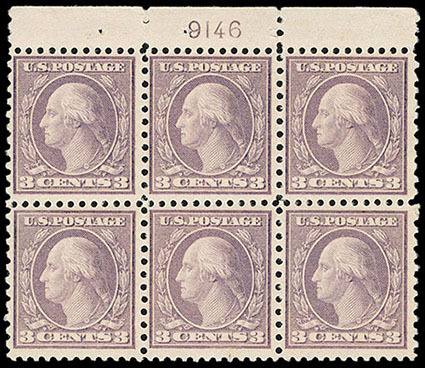 1919, 3¢ violet, rotary coil waste, perf 11 x 10, top margin plate no. 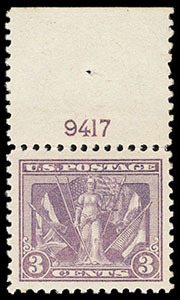 "9146" block of 6, o.g., never hinged (top center stamp with small gum skip), strong color, F.-V.F. 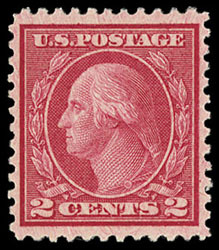 1921, 2¢ carmine rose, rotary coil waste, perf 11, o.g., never hinged, exceptional centering, very fresh with uncommonly deep color, Extremely Fine; with 2003 P.S.E. certificate for pair. 1920, $2 carmine & black, o.g., never hinged, rich colors, precise centering amid evenly balanced margins, an Extremely Fine gem. 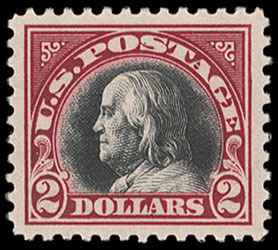 1920, $2 carmine & black, o.g., never hinged, rich colors, large margins and well balanced margins, Extremely Fine; with 2003 P.S.E. certificate Graded (XF 90, SMQ $475).